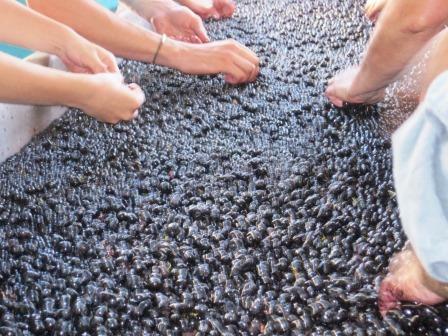 Terret Noir is a blending grape used in the Southern Rhone Valley for red Chateauneuf du Pape wines. There are also two versions of the grape that are used to produce white wine, Terret Blanc and Terret Gris. However, both of those white wine versions are not allowed by AOC law to be planted in Chateauneuf du Pape. Terret Noir and the white wine versions of the grape are also planted in the Languedoc Roussillon appellation. In fact, it is thought that the grape first appeared in the Languedoc region. When the thin skinned grape is included to the blend, it can add interesting aromatic complexities, flavors of bright plums, tannin and often tart qualities to the wine. The grape is close to extinct from the Chateauneuf du Pape region today as less than one hectare of vines remain in the entire appellation. Terret Noir is not often seen outside of the Southern Rhone. Aside from Chateauneuf du Pape, the grape is also found in Corbieres, Minervois, Gigondas and the Cotes du Rhone appellations where it is used as a minor blending grape. Terret is most often blended with Grenache. Some producers also refer to the grape as Terret Bourret, Terre Chernyi and Terret du Pays. For a wine and food pairing, it is very difficult to find wines made from the grape as a single varietal. However, due to its high levels of acidity, it would work with best with dishes that need a lot of freshness, perhaps tomatoes and other salads or vegetable courses.